“We can receive from bishops the task of overseeing parishes...” (Constitutions 46) “A parish is a certain community of Christ’s faithful stably established within a particular Church” (Code of Canon Law 515; The Presbyter, shepherd and guide for the Parish Community, n.18). For us the parish is a “family of families.” Thus, we do not forget that in the parish “our responsibility is to bring to families the nourishment and comfort of the word of God, the sacraments and other spiritual resources; and to defend and strengthen them in a way that the life of holiness of the Holy Family of Naza-reth may shine forth and be expressed in them in a singular manner while they themselves are transformed into excellent examples of that same life of wholeness and holiness” (Constitutions 46). Each of our Communities sees to it that the chapels of our houses and schools are true centers of worship, responsive to the spiritual needs of the faithful, particularly of youth and families. As priests we remain ever ready to render services proper to our ministry (Directory 64). III. Service of charity (social action). 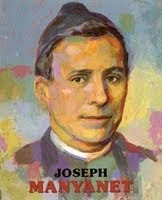 Our ministry is at the service of the proclamation of the gospel, but we put special emphasis on the hidden years of Jesus in Nazareth: “the Gospel of Nazareth, which Saint Joseph Manyanet perceived and handed on to us, we continue to echo in the Church with the testimony of our lives and the strength of the Word for the salvation of the whole world” (Constitutions 6). c. Looking for the means to make present our spirituality. We incorporate in our catechetical programs, whether in dioceses or in our own parishes, the Gospel of Nazareth, of which we are “witnesses and apostles,” as our charismatic contribution. We propose to families, beginning with the little ones, the domestic values and virtues inspired by the Holy Family of Nazareth: communion of life, unity, work, dialogue, prayer, forgiveness, silence, service... (General Chapter Documents III,1.1). We also promote the Nazarean signs and symbols, for example: the image of the Holy Family in all homes; the nativity scene for Christmas, and the traditional manifestations of each place and culture. We try not to promote a catechesis only for the reception of the sacraments, but we design catechetical programs for the long term. 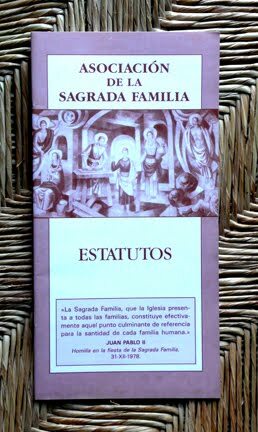 We urge the integral formation of the person in every moment of his/her life; and we especially promote family catechesis. The liturgy, as the school of Christian spirituality, is one of the most important areas of parochial ministry, to which we give special attention. We also organize groups of people and dedicate our efforts in their formation. 43.1. The liturgical year and the Sunday celebration. The liturgical year, and particularly Sunday, is the framework where the lives of the faithful acquire relevance and reveal themselves as a community gathered around Christ, its head and pastor. We dedicate time and efforts to promote the preparation for the whole liturgical year in the liturgical catechesis for the Christian community, which preparation will help us celebrate our faith with great care. For us, the cycle of Advent/ Christmas/Epiphany acquires a special significance because the mystery of the incarnation of the Son of God is realized in it. We contemplate the familial life of Jesus in Nazareth, which moves us to announce it and celebrate it with joy. 43.2. The Proper Calendar. Our congregation makes use of its own calendar for our celebrations in order to live more intensely “the mystery of Christ through the whole year” with faith, hope and love. The person who oversees the parish or the center for worship encourages the celebration of the feast of the Holy Fami-ly,”the feast of feasts,” in whose Eucharist the families are consecrated to the Holy Family and is a special occasion to invite couples who were married during the year to give thanks for their marriage or for their silver or golden anniversary. We also celebrate the other mysteries of the childhood and the hidden life of Jesus and the feast of Saint Joseph Manyanet, apostle of the Holy Family and of the family. 43.3. The liturgical team. We promote liturgical teams in our parochial communities. These teams are responsible for the preparation, coordination and evaluation of each one of the celebrations of the liturgical year. It is made up of the leaders of the various services, as well as the priests. The sacraments, instituted by Christ and entrusted to the Church, are signs and means with which we express and strengthen our faith. Praise is given to God, and men and women are sanctified (Code of Canon Law 840). For that reason, we follow the norms of the Church and of the rituals for its celebrations. We try to have teams of laity in our parishes which are instrumental in the preparation for the sacraments of Christian initiation and marriage. The sacraments of baptism, confirmation and Eucharist are so intimately related to each other that all of them are necessary for full Christian initiation (Code of Canon Law 842). 45.1. Baptism. A milestone in family life is the birth and baptism of a child. The child is baptized in his/her parents’ faith, so it is necessary to do a catechesis with them and with the godparents, both to prepare for the sacrament and to enlighten their faith. During the sacrament some members of the preparation team should be present to help in the sacrament and to give the testimony of Christian community. For the feast of the Presentation of Jesus, “Candelmas,” we invite the parents of the children who were baptized during the year to participate in a thanksgiving celebration, remembering what Mary and Joseph did with their child Jesus. 45.2. Confirmation. We give great importance to the catechesis previous to this sacrament, especially if the candidates are teenagers or young adults. The youth ministry related to this sacrament might be decisive for the formation and vocational orientation of the youth. 45.3. The Eucharist. We share with the faithful the celebration of the Eucharist: “source and summit of the Christian life” (Lumen Gentium 11), sign of unity and source of sanctity. We urge the faithful to take an active part in the celebration of the Eucharist, to receive it frequently and with reverence, and worship it with deep adoration (Code of Canon Law 898). We give special importance to Masses with families, for example, a “Family Mass”, the “Mass for Quinceaneras”, etc. We are available to carry out, personally or through the Extraordinary ministers of the Holy Eucharist, Holy Communion to the homebound and sick who request it. “The Lord Jesus Christ, physician of our souls and bodies, who forgave the sins of the paralytic and restored him to bodily health, has willed that his Church continue, in the power of the Holy Spirit, his work of healing and salvation, including her own members. This is the purpose of the two sacraments of healing: the sacrament of Pe-nance and the sacrament of Anointing of the Sick” (Catechism of the Catholic Church 1421). 46.1. Penance. The celebration of the sacrament of penance (contrition, confession, penance) is a special moment to show the merciful face of God, who welcomes his children. On our behalf, we always remember what the Directory says when it speaks about the priestly ministry: “In our administering the sacraments, especially that of Reconciliation, we strictly and faithfully abide by the Ritual and the statutes of the diocese within which we reside” (Directory 61). We take great care in the initiation of children to this sacrament. Further, it enriches them to receive this sacrament from time to time, in a community celebration with adults, especially during the most important liturgical seasons, with the purpose of teaching them the meaning of a sinful people who has been redeemed. We are always available to attend to the faithful who request this sacrament and also to provide spiritual guidance when asked. 46.2. The anointing of the sick. The reception of this sacrament is also an appropriate moment for family ministry since this is often a time when the family is together and needs companionship, counseling and divine help. We always show an attitude of closeness and fraternity towards the families who ask for this sacrament. The sacraments of priesthood and marriage are meant to be for the salvation of others. Certainly, they contribute to the salvation of the priest and the spouses, but also through service to others (Catechism of the Catholic Church 1533-1534). 47.1. Priesthood. Those who receive the sacrament of priesthood are consecrated “in the name of Christ to be the shepherds of the Church with the word and grace of God” (Lumen Gentium 11). We exercise service to the people of God by teaching, divine worship and pastoral governance” (Catechism of the Catholic Church 1592). 47.2. Marriage. “For this reason Christian spouses have a special sacrament by which they are fortified and receive a kind of consecration in the duties and dignity of their state” (Gaudium te Spes 48). We offer to the men and women who ask for the sacrament of marriage a welcoming disposition, availability and joy. We give great importance to the immediate and long-range preparations. The celebration will show a familial environment filled with bliss and hope, in which the spouses are invited to consecrate their marriage to the Holy Family of Nazareth. Faithful to the recommendations of the Church, we guide the faithful towards acts of piety and devotion, giving to them a content which reflects true Christian prayer and formation. We pay attention to the form and the content, trying to guide properly the piety and devotion of the faithful, including devotion to the saints. Our priority is given to the Holy Family of Nazareth, since “through our lifestyle and through the various forms of apostolic ministry we consider ourselves bound individually and collectively to bring to all families and households the example and the virtues of the Holy Family of Nazareth” (Directory 55). Besides the sacramental liturgies, the celebrations of the Word and the sacraments, and other events contained in our congregational calendar, we also pay attention to the different forms of piety of the faithful and to popular religiosity. We sustain the faithful and support them with pastoral discernment and, if the moment comes, we purify them taking advantage of the religiosity inherent in them in order to guide them towards the mystery of Christ. The principle of solidarity, also named “friendship” or “social charity,” is a demand that flows from human and Christian fraternity (Catechism of the Catholic Church 1939). Thus, we dedicate our best efforts so the testimony of charity of our Christian communities reaches particular persons. We organize to give an answer to the problem of poverty, both among the members of our parish and in other parts of the world, as far as is possible. I. Assistance: urgent action for needs that cannot wait. II. Promotional: empowering the person without resources of his/her own. III. Preventive: working to break the cycle of poverty and exclusion through campaigns of information and increased awareness. We do not forget, however, that the virtue of solidarity goes beyond the immediate material solutions, that is, it welcomes, listens to, counsels the people who are in need. We know that “the first of the apostolates is the witness of our own consecrated way of life, which we are bound to foster through prayer and penance” (Directory 54). For this reason, we cultivate those qualities recommended to the minister of Christ, such as apostolic zeal, appropriate preparation for ministry, serenity, charity, and capacity for dialogue (Directory 62). We collaborate generously with the ministry of the diocese, and make ours the diocesan guidelines and the guidelines of pastoral action that belong to our Institute. We work together with the Parish Pastoral Council. Within it we ponder and reflect upon our pastoral activities. Inspired by the word of God, we plan objectives, review their implementation, and periodically examine our work globally. In each Delegation we try to have periodic meetings with those in charge of the parish or center of worship, in order to coordinate the ministry. 50.1. The parish priest. The parish priest is the proper pastor of the parish entrusted to him. He exercises the pastoral care of the community entrusted to him under the authority of the diocesan Bishop (Code of Canon Law 519). The pastor is appointed by the Major Superior and presented to the Ordinary. In collaboration with the Community he is responsible for the commitment undertaken by the Congregation before the Church (Directory 63). “They diligently assist young people as well as spouses and parents, making it possible for them to come together in friendly associations which are built up in the Eucharist (...) Although they have obligations towards everyone, they dedicate themselves in a special way to the poor and to those of lower social status (...) They are extremely solicitous for the sick and the dying, visiting them and strengthening them in the Lord” (Constitutions 46). 50.2. The vicar. The vicar cooperates with the parish priest, and, under his authority, shares actively in the important work of parochial ministry. In the parish priest and his vicars there must be fraternal communication, mutual charity, unchanging respect and mutual help with counsel and dialogue, each taking care of their duties and obligations with firm agreement and common effort (General Chapter Documents 30,3). “The Parochial Vicar will inform the parish priest regularly of pastoral initiatives planned and completed, in such a way that the parish priest and vicar or vicars together may see to the pastoral care of the parish for which they are both (all) responsible” (Code of Canon Law 548,3). The Pastoral Council is an indispensable instrument for the pastoral action plan of the parish. It is an instrument of communication and co-responsibility. It is the impelling force of the parochial plan along with Diocesan directives (Code of Canon Law 536,2). For us, it is also a means of “extending and empowering the collaboration of the laity in our mission of evangelization” (General Chapter Documents IV,4). It has a consultative character in everything which affects persons and their particular state. It is set up to detect situations in life which require major and prompt attention. As a general principle, it is intended that there be diverse representation from all pastoral areas which exist in the parochial community. The parish priest or his delegate will convene the Pastoral Council meetings, unless the Statutes of the Council determine otherwise. The plan for regular meetings and the permanence and activity of the Pastoral Council will function under the directives of the diocese, if they exist, and if not, by decisions made by the organized Pastoral Council. The Code of Canon Law states that each parish is to have a Finance Council (Code of Canon Law 537). Its goal is to take care of the finances of the parish, preserve the patrimony, provide for the expenses of the pastoral tasks, keep the faithful informed about the financial management of the parish and act according to diocesan norms. In parishes, either those entrusted to the Institute in perpetuity or through a timed contract (Code of Canon Law 500,3), there will be clarity regarding ownership of goods, an inventory and the administration of the religious community separate from that of the parish (Code of Canon Law 520; Directory 157). The salary of the pastor and vicar or vicars will follow the diocesan guidelines; however, they will be registered in the finances of the community, which will be separate from the finances of the parish. Financial collaboration with the Vice-province or Delegation will be established by the Vice-provincial Council or Delegation. Pastors will be diligent in taking care of the parochial archives and books of Baptism, Marriage, Deceased and others prescribed by the Conference of Bishops or the diocesan bishop (Code of Canon Law 535,1-5). We take care in sending reports of the sacraments celebrated to the diocesan curia following the established norms. Among the notifications of which we take special care are those of the sacrament of marriage, which in many places involves civil regulations. Besides the books already mentioned, our parishes must not fail to have inventories, reports of the Pastoral and Finance Councils, and other committees, in order to have continuity in the work we have undertaken, according to diocesan norms.